What was collected by 50 local community volunteers on Saturday 12th January. Thank you very much to the 50 people who generously volunteered to help clean Lunderston Bay of litter at our January Beachwatch. 81.3kg of rubbish was collected in 18.5 bags. These results are now sent to the Marine Conservation Society to form part of the national coastline picture. You can see the full details of exactly what our volunteers collected and the source in this PDF: Lunderston Bay – Survey 12 Jan 2019. 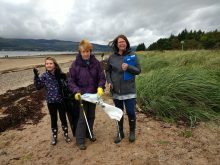 Would you like to get involved and help turn the tide on plastic and other litter? Our next Beachwatch event is on Saturday 27th April at 11am. We’d really appreciate your help again then!